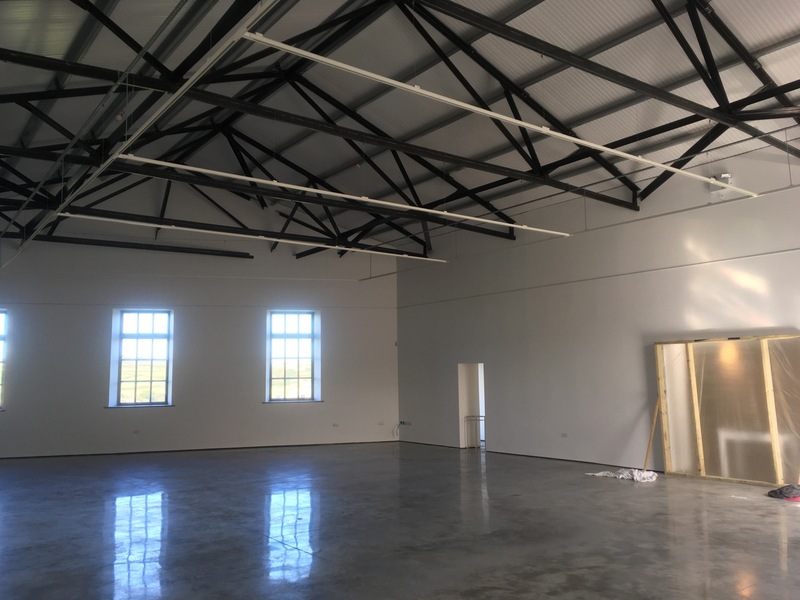 Yesterday’s post about my trip with my wife to Penwith, in the far west of Cornwall, ended with a mention of an art gallery in St Just: the Jackson Foundation. Kurt Jackson is one of our favourite artists, and probably one of the finest living British painters of natural phenomena – from flora and fauna to land, sea and riverscapes. 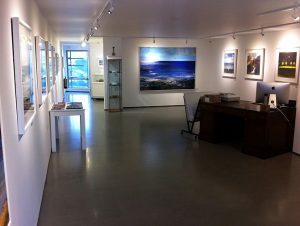 Looking at his currently exhibited work at St Just inspired us to deviate from our road home to take a look at a place that is one of his greatest inspirations and which features in much of his artwork, and in a video installation that can be seen in the gallery upstairs: Cape Cornwall. I included some pictures of it in yesterday’s post. Here’s another. You might have seen some lovely reproductions of his work at Paddington Station in London some ten years ago, decorating the wooden boards screening building work that was going on there at the time. In recent years his ‘projects’ have been inspired by a particular route – a river, a prehistoric track way, or a workplace and its inhabitants – quarry, mine, fishermen, farmers; a group of fauna or flora – crows, bees, a tree – or just his personal response to a particular place. His paintings often include written notes on the sounds, wildlife and other sensual influences that pervade his warm, almost spiritual depictions of the scenes in which he immerses himself in order to capture their living essence and biodiversity – their past and present ‘clamour and silence’, as the catalogue describes his ‘This Place’ exhibition. Born in Dorset in 1961, he graduated from Oxford in 1983 with a degree in zoology; his love for and deep empathy with living things animates all of his work. 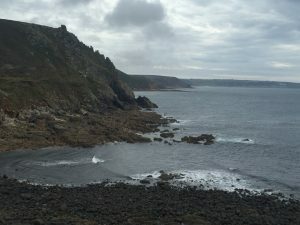 A year later he moved to Cornwall with his wife, and settled in St Just, on the marginal edge of mainland Britain, a ‘transitional space’, as he calls it, between the the wild and rugged moorland, granite outcrops and craggy cliffs of west Cornwall, and the Atlantic Ocean. Three illustrated monographs on Jackson have been published by Lund Humphries depicting his career so far; A New Genre of Landscape Painting (2010), Sketchbooks (2012) and A Kurt Jackson Bestiary (2015). A Sansom & Company book based on his touring exhibition Place was published in 2014. His passionate interest in psychogeography – the culture, lived history and precarious ecology of our world – is reflected in his numinous work, but also in his involvement with charities and campaigning organisations, from his role as artist in residence on a Greenpeace ship and at Cornwall’s Eden Project (and at Glastonbury Festival! ), to acting as ambassador for Survival International. He has also worked closely with Friends of the Earth, WaterAid, Oxfam and Cornwall Wildlife Trust. We managed to catch his latest exhibition – ‘Place’ – just before it closed – today. It arose from a collaboration with 32 writers from a varied range of backgrounds, and reveals the physical diversity of the British landscape, whilst providing an insight into the concept of ‘place’ – that ‘collective sense of identity, meaning, longing and nostalgia present within the British psyche’, as his website puts it. Words are provided by writers Robert Macfarlane and Richard Mabey, as well as by scientists, poets, and others, each providing a personal transcript or evocation of a place they felt connected with. Jackson’s pictures are complemented by these portraits and images in words. Obsession sees Jackson follow his studio assistant on surfing trips around the Cornish coast. This body of work was produced in partnership with Cornwall-based eco-campaigners Surfers Against Sewage to highlight the charity’s work to protect the UK’s oceans, waves and beaches for everyone to enjoy safely and sustainably. For reasons of copyright I have been unable to reproduce any images of his artwork here, but the links I’ve included will take you to a number of websites where you can enjoy some beautiful representations. If you’ve never seen his work before, I’d urge you to take a look. Even better, take a trip down to the land of Lyonesse and man engines, where DH and Frieda Lawrence strode the cliff paths, haunt of the ghosts of countless hard rock Cornish miners who lost their lives or limbs extracting the minerals that transformed this world of Celtic fantasy into an industrial, working, living landscape. 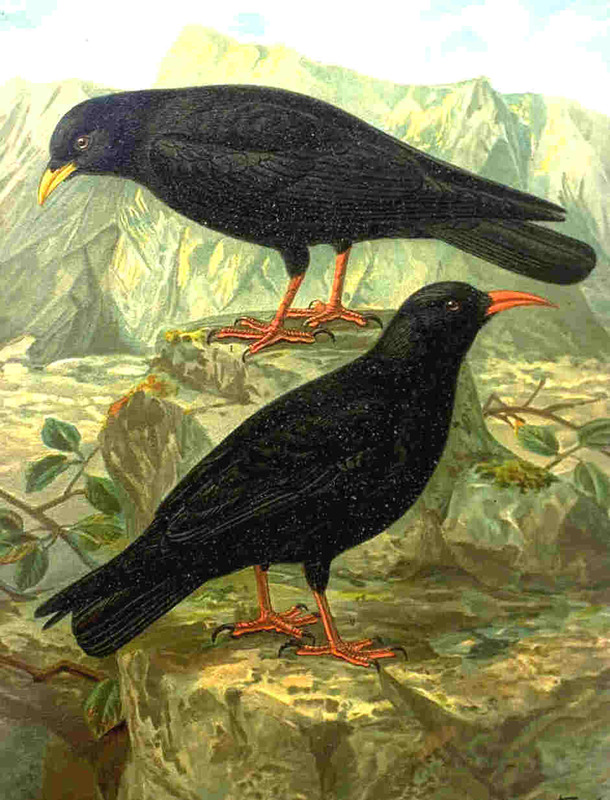 legend has it that King Arthur didn’t really die: he was transformed into a chough. For this reason it’s still considered unlucky to kill or harm one of these handsome corvids – one of which I was lucky enough to spot at Cape Cornwall yesterday. Thanks to Fynn, at the Jackson Foundation, for the photos of the gallery interior.